Separately, the Pentagon is working with Taiwan's government to bolster the island's air defenses in the face of growing missile and aircraft threats from China, said Randall G. Schriver, assistant defense secretary for Asian and Pacific security affairs. Schriver said in an interview that expanding Chinese military bases and access to foreign ports around the world is a key feature of Beijing's Belt and Road global infrastructure development initiative. "The military is supportive of a comprehensive strategy and in many ways the leading edge is predatory economics," Shriver told the Washington Free Beacon. Both Chinese military and commercial expansion are "supportive and complimentary of one another," he said, adding "where China is using economic tools, they're often doing so in order to create access and potential bases." China has one overseas military base in Djibouti on the Horn of Africa and is seeking additional bases in South Asia and the Middle East, including at Pakistan's Gwadar port, nearby Jiwani, Pakistan, and further west near Iran. China also operates large-scale commercial port facilities around the world, including at both ends of the Panama Canal, that the Pentagon has dubbed part of China's "string of pearls" base system along sea routes to China. Asked if the Pentagon is seeing a Chinese foreign basing structure develop, Schriver said: "There's kind of a spectrum on which of those activities can fall. They don't necessarily need full up bases like Djibouti. A nearer term step might be gaining access. What we do see is some of their infrastructure projects, and particularly where they're looking at ports and infrastructures around ports, we believe they're also negotiating for access in many cases." An access agreement would allow Chinese troops, aircraft, and ships to use bases and facilities. 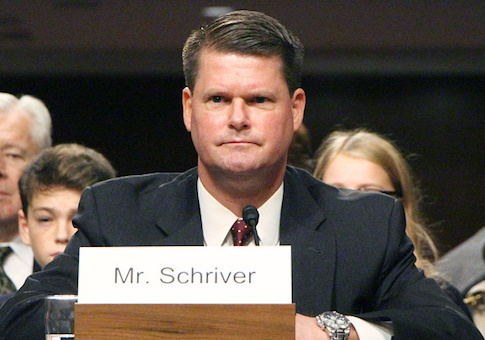 Schriver made the comments in discussing the Pentagon's latest annual report to Congress on the Chinese military, made public last month. The People's Liberation Army, as the Communist Party-controlled military is called, has made quantitative and qualitative advances in both weapons and strategy after many years of large military spending increases, Schriver said. "You definitely see steady progress. That's what you get with 8 to 10 percent increases in your official budget every year—we know they are spending more—and it's with a purpose and its in support of a strategy," he said. Chinese military advances in both nuclear and conventional arms, with an emphasis on new and more capable missile systems, is "all the more reason to implement the national defense strategy and respond in a way that helps us keep our edge," Schriver said. The Pentagon's new national defense strategy identified China for the first time in decades as a "strategic competitor" seeking hegemony in Asia and ultimately "displacement of the United States to achieve global preeminence in the future." On the Belt and Road Initiative, the annual report states that China's leaders are using the initiative as a way to gain control over developing nations that accept loans and other aid for infrastructure projects. The initiative "is intended to develop strong economic ties with other countries, shape their interests to align with China's, and deter confrontation or criticism of China's approach to sensitive issues," the report said, noting that states taking part could become economically dependent and then pressured by Beijing. In August, a bipartisan group of senators urged the Trump administration to block the International Monetary Fund from bailing out several countries victimized by predatory Chinese loans. For example, Sri Lanka in July 2017 signed a 99-year lease for the Hambantota Port with a Chinese state-owned company. Similar deals were reached for ports in Piraeus, Greece, and Darwin, Australia. "That's what's led to the issues in Sri Lanka, potential issues elsewhere where they see fragile economies and vulnerabilities, they come in with, in many cases, loans that have a lot of strings attached," Shriver said. "If the country in question is unable to meet the terms and pay back the debt a lot of times it involves sacrificing sovereignty, sacrificing control to the Chinese," he said. "So it's something of great concern to us, and again the military is both supportive and complimentary of those efforts." On Taiwan, Schriver said the Pentagon has been discussing Taipei's air defense requirements with Taiwanese officials and is considering sales of new weapons. Taiwan currently has several Patriot anti-missile batteries and an aging fleet of F-16 jets. The island is heavily outgunned by China, which has deployed more than 1,500 short- and medium-range missiles within range of Taiwan. In April, Chinese military forces conducted large-scale war games near Taiwan in a show of force designed to deter the island from declaring formal independence. The Pentagon report said that in the year between 2016 and 2017 China increased the number of strike aircraft and bombers by 130 aircraft, from 400 bombers last year to 530 bombers this year. Schriver said not all the new strike aircraft are heavy bombers. Many are "strike aircraft designed for contingencies in the near abroad." "A lot of this is scenario driven and Taiwan remains a central organizing principle for the PLA," he said as well as for contingencies in the East China Sea, and South China Sea. "So that would entail multi-role strike aircraft as well as the heavy bombers," he said. The Trump administration is moving to end the practice of selling large, multi-billion dollar arms packages to Taiwan. Instead, the Pentagon will sell needed defensive weapons on what Schriver described as a "normal" basis similar to those used with other allies under the Foreign Military Sales program. "We are working with Taiwan to try and ensure they're implementing their overall defense concept which we think has some very good thinking involved in it, and gives them the opportunity for asymmetric approaches that will help them defend the island," Schriver said. "But there's no doubt that this is a focus for China's force modernization for a long time and is paying off in real capabilities that are concerning, so we have to do our part in implementing the [Taiwan Relations Act] working with Taiwan to have appropriate responses." The 1979 Taiwan Relations Act authorizes sales of U.S. military equipment to Taiwan, something opposed by Beijing that regards that island as a breakaway province. Taiwan is located about 100 miles from the southeast China coast. Nationalist forces fled to the island during a civil war in 1949. Instead of packages, the U.S. government will respond to Taiwan's arms requests "as they come in and treat Taiwan like a normal FMS partner," Shriver said. Taiwan wants to buy the vertical takeoff and landing version of the advanced U.S. F-35 jet. Schriver said no decisions have been made on selling new jets but "there's certainly discussion on air defense requirements." "They've publicly talked about advanced fighters and that may be part of the solution, but we look at more mission requirements rather than any specific platform," he said. Schriver also said the U.S. government has approved licenses for American defense contractors to discuss helping Taiwan build submarines—to bolster defenses against naval threats. "I think that's the primary effort, to see where Taiwan goes with this indigenous platform, to see how our companies might be in a position to support them," he said. Schriver said China, as it has in the past, issued a diplomatic protest note over the Pentagon's latest military power report. Asked if the Pentagon is concerned about particular weapons development by China, Schriver said the build up of long-range precision-guided munitions is a worry. "The longer-range precision munitions, obviously, introduce some complicating factors for our forward deployed forces," he said. "That is something that is not exactly brand new but their enhancement of those capabilities means that we have to accommodate that in order to keep our advantages and our edge." On China's nuclear weapons buildup, Schriver said Beijing is upgrading all three legs of their triad of forces: H-6 bombers, long-range missiles, and ballistic missile submarines. "So their version of a triad is being strengthened," he said. "It's still one of the more opaque areas, particularly when you get to questions of how many warheads." China's nuclear arms programs are among the more secret military efforts and are largely located in a 3,000-mile-long underground complex dubbed China's Great Underground Wall. Beijing also is adding multiple warheads to its missiles raising questions about estimates of the number of warheads in its arsenal. China is believed to have at least 260 strategic nuclear warheads and an unknown number of smaller tactical nuclear warheads. However, the actual number could be much higher.